It’s time for another Cute Outfit Ideas of the Week! This edition is dedicated to one of my favorite topics – handbags. Oh how I love thee. I’ve been using this striped tote like crazy! The new Jack + Mulligan’s weekender totes instantly grabbed my attention and made me want to rent a sailboat, hop on and sail away. I imagined the perfect nautical striped top, comfortable shorts and shoes, and packing my bag with necessities for a day of sailing. The totes are perfectly over-sized for your needs and crafted in water-repellent canvas for your day out on the water. They are priced from From $140.00 to $210.00. 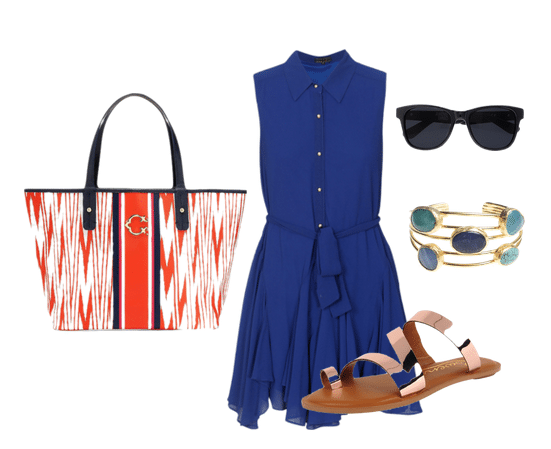 The C. Wonder Printed Striped Signature Tote has become a celebrity favorite. Celebs such as Reese Witherspoon, Kourtney Kardashian and Molly Sims have all been seen carrying it around and who can blame them? Just look at it! This go anywhere bag is very roomy and has great detail such as an interior key clip, a boxy yet relaxed structure, and soft leather-like flat handles. Take it to the gym, the grocery store, a weekend getaway or to the farmer’s market. The tote is priced at $78. I based the outfit above on Kourtney Kardashian who was seen wearing a royal blue ensemble with the bag. I loved it! Which tote was your favorite? I can’t answer that. I just can’t.